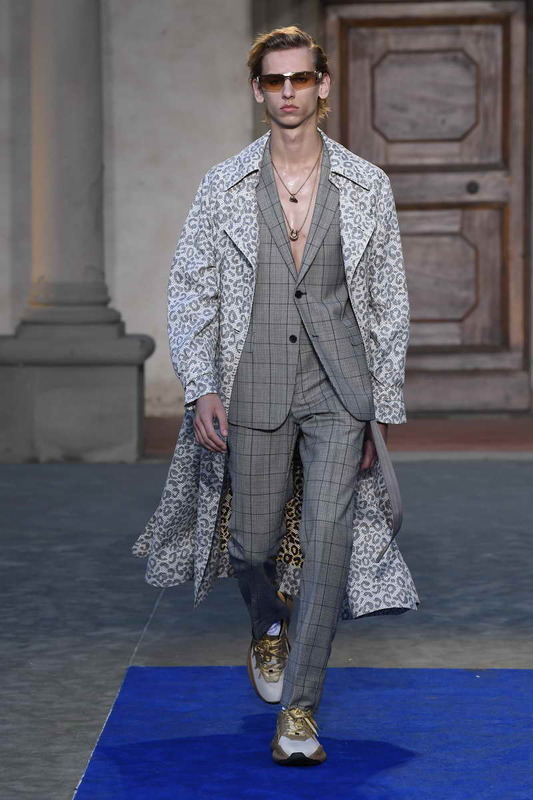 Creative director Paul Surridge shapes the now of Roberto Cavalli in a tension to the future embedded with the awareness of the past. The jungle spirit hits the concrete jungle to be reset in synch with the clock of time. The energy of immediacy pervades the collection. Function and proportion are main preoccupations. A reduced language of shapes is the playground for intense surface tension. 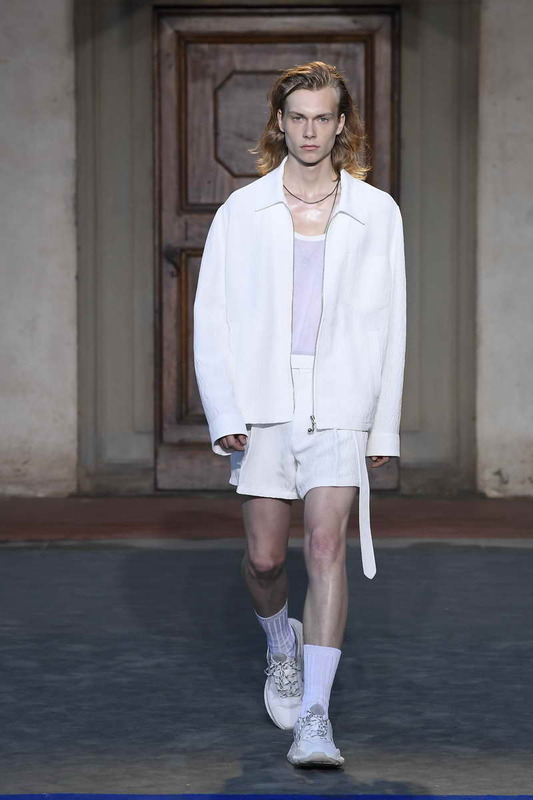 The vocabulary is compact and effective: decisive outerwear, pragmatic double-face blousons, athletic tailoring in rethought proportions, tactile knitwear, tailored chinos, slouchy bermudas, shorts. 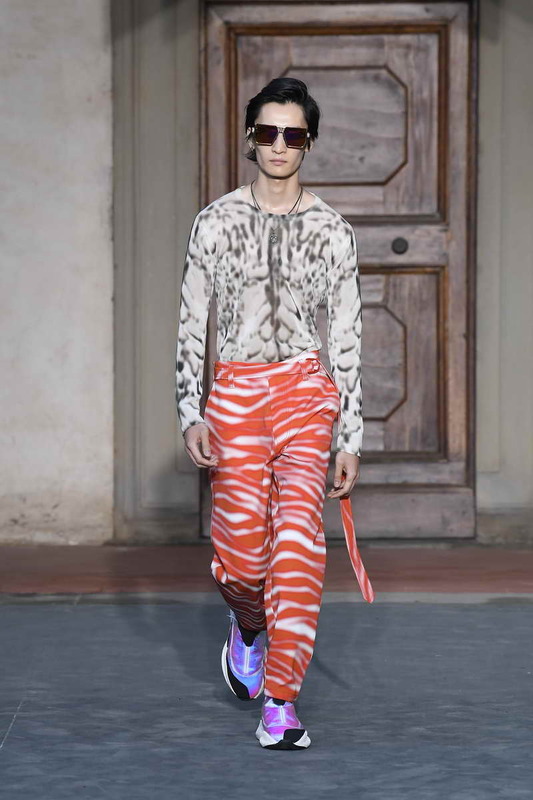 Ease as the ultimate swagger, with eye-shielding visors and polymath running shoes – made of python and metallic leather or animal print technical jersey wrapping a mesh base, with rubber soles embossed in reptile patterns – speeding at a futurist pace. Chains at the neck underline the assertive cockiness. 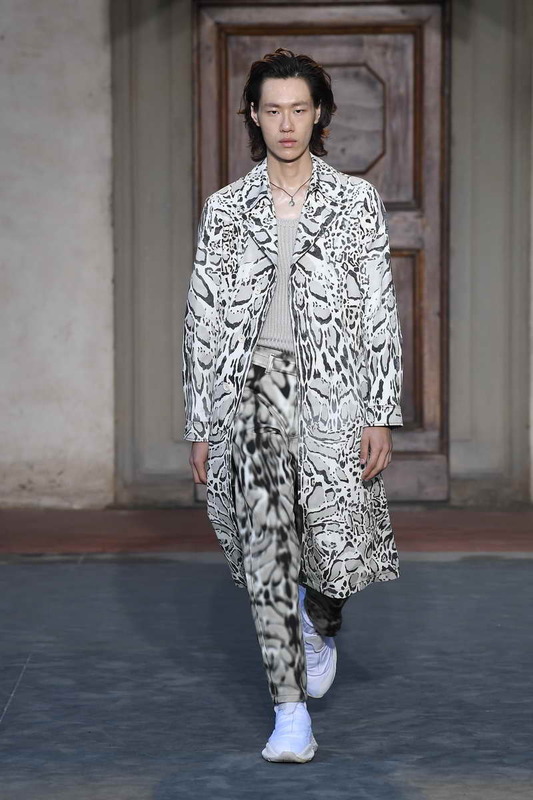 A journey through the abstractions of animalier begins in white, moves through a collision of pop hues and ends in black. 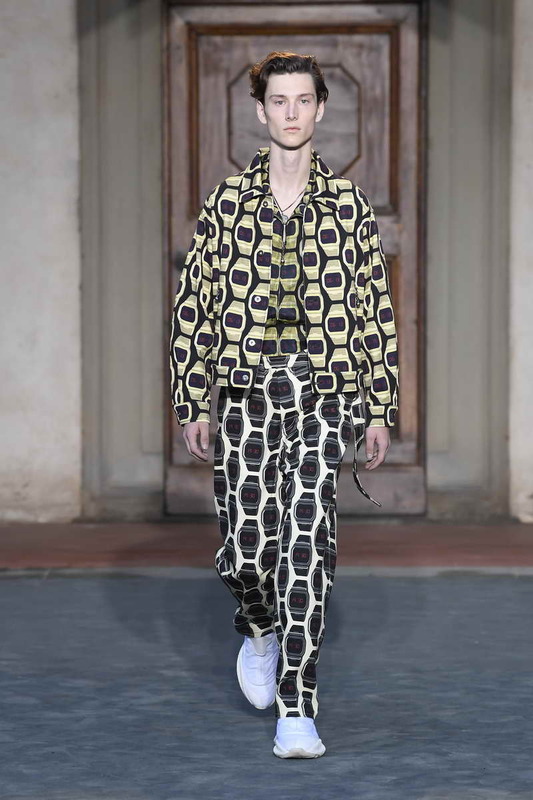 Animal motifs are sliced, clashed, hybridized into new species; they are perforated onto leather, turned into devorè, sun-bleached and put out of focus; they morph into monochromatic jacquard textures or are overprinted on classic checks. The spirit is airy, relaxed and confident. Artisan touches bring craft onto the details: blanket stitches, hand-embroidered good luck motifs, an embroidered pocket. Embellishment is reset, too: it is functional rather than decorative. Macramé stitches and intarsia give a warm, artisanal feel to knitted pieces which offset the metropolitan conciseness of the looks. Immediate and connected, the reloaded Roberto Cavalli ethos heralds time as the ultimate luxury. Time of catching the moment and living it. 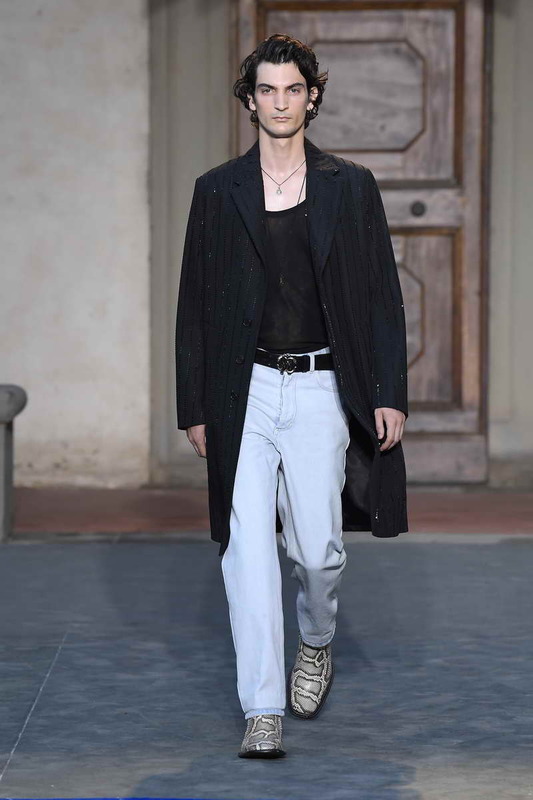 On the occasion of Roberto Cavalli Menswear Show at the Pitti Immagine Uomo, the brand launches the men’s eyewear collection developed with Marcolin.